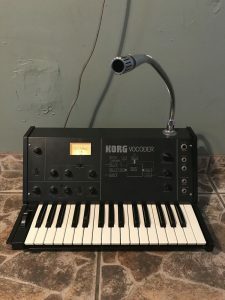 ” Have to reluctantly let this beauty go as i haveent budgeted for the holidays as well as i needed to, so here is an extremely rare and beautiful korg vc-10 you have the opportunity to have in your collection. The first thing I would like to note is it has the original microphone that came with the unit stock. This is a piece that is commonly lost over the years and has a special connector so no other goose neck style mic will fit in the jack on the top. IOt is similar to xlr but slightly bigger in all dimensions. Another mic can be used in the “mic input” jack if needed but I have always been completely satisfied with the stock one. This vocoder is a 20 band vocoder so it has 20 individual vioces that can be played at one time. that’s twice as many fingers as one has to use so you cam get very creative. 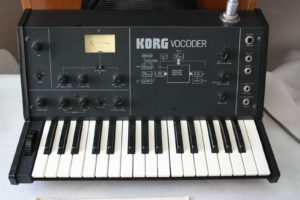 “FOR SALE RARE VINTAGE ANALOG VOCODER Korg VC-10 in VERY GOOD USED condition ( PLEASE LOOK ON A PICTURES) . This from my studio incl original Mic and user manual, original. This a cult analog vocoder like Moog, Bode and etc. “In very good condition for its age. Has some minor scratches and cosmetic wear but everything on the unit works. All keys, knobs and switches are responding. This unit has been serviced. It also comes with the original mic. “I have a rare vintage Korg VC10 that was played by The Tubes! I purchased it 5 years ago from their keyboard player on Craigslist and haven’t used it. Hoping it can go to an analog collector that will restore it! I plugged it in when I first got it and it worked fine apart from scratchy pots and a dead key. I listed it as is because I have sold all of my equipment and was not able to test it since then. That being said it had just been in my gear closet the entire time. VU powers up fine (as pictured) and responds to the keys being played. I wish I had time to restore it because these are great but I have to let it go because I am moving and not taking anything with me. I do not see other listings with the error currently, or in recent sales. The serial number is, as expected based on above, lower than typically seen, at #1600**. 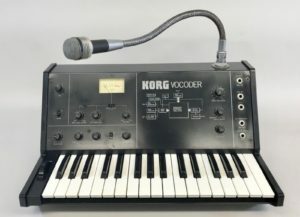 Lovely Korg VC-10 vocoder on offer. These are a clever compact vocoding package, has a built in paraphonic synth voice so you need nothing more than a mic to make it work. a bit and you can get a really rich classic vocoding sound. 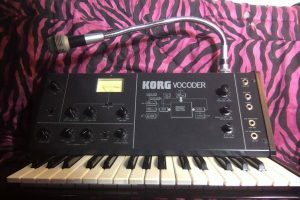 “I´m selling my Korg VC-10 vocoder along with the microphone and the hard-case. It is in working condition. Sometimes the microphone needs to be adjusted to work. Maybe a simple fix. 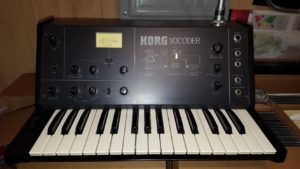 “For sale is a old vintage KORG VC-10 analog vocoder. Bought it from its original owner who took it on tour and put it into storage for more than 10 years. Bads: Missing the original microphone cap. The original mic is here but untested. It needs soldering work. Both external Mic and Input work, but the signals seem to be a little weak (not sure if it is normal since it works). I do not have the original gooseneck microphone. Nor have I ever used one with this vocoder, as it requires a non-standard connector. The other 1/4″ microphone input works perfectly. All other functions / keys / knobs work perfectly. Ein sehr schönes Gerät noch von meinen Opa der sich damit beschäftigt hat. Es muss aus den 70er sein, sieht aber dafür noch sehr erhalten aus. Das gerät habe ich prüfen lassen und alles ist voll funktionsfähig. Geringe Spuren sind auf der Oberfläche zu sehen aber das ist denke ich normal. Die Knöpfe und Tasten lassen sich sehr flüssig bewegen. Keine Brüche, Dellen oder sonstige solche Defekte. Leider ist das Mikrofon nicht mehr vorhanden. Die Geschichte von dieses Gerät ist, wie ich im Netz nachlesen konnte, sehr interessant. Viele bekannte Künstler haben dieses Gerät benutzt. 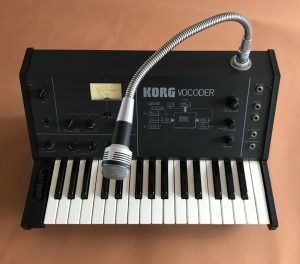 “Biete an , einen Korg VC-10 Vocoder mit original Schwanenhals Mikrofon . Verkaufe ihn nur , weil es die Umstände erfordern :-(( ..sonst würde ich ihn sicher behalten !! “Since 2004, photographicdecor is proud to offer you some amazing fine art photographs, art, music instruments and jewerly. 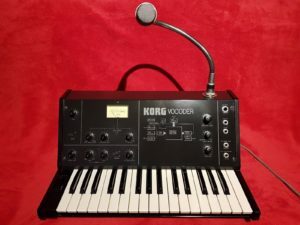 “This is a rare, vintage classic Korg VC-10 Vocoder, from the late 70s or early 80s…….as used by Emerson Lake & Palmer, ELO and many more! I bought it years ago on a whim & never got round to actually trying to work out how to use it! It’s just been gathering dust ever since so it’s time to let it go to somebody who can get the most out of it.